Pears like to get their leaves and stems done. They always feel better after a day at the salon. 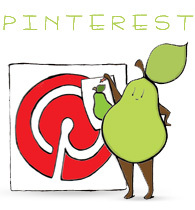 Categories: pear people | Tags: illustration, leaves, Pear people, pear salon, relaxing, salon, stems | Permalink. Like the blonde flip. Very stylish. All she needs now ia a string of pearls and a martini! YES. THIS. The salon quartet needs to be a print, too. At this rate I’m going to need a whole room for all the Angry Pear prints I want. Hahaha. Thanks! I’m still working on getting the prints to look right. Very Meryl Streep from The Devil Wears Prada! We actually have a salon called the Green Pear Salon. I would love to be able to get prints of these! Hi, thank you, yes of course! Sorry about getting back to your comment so late! If you’re still interested, you can email me at angriest.pear@gmail.com.